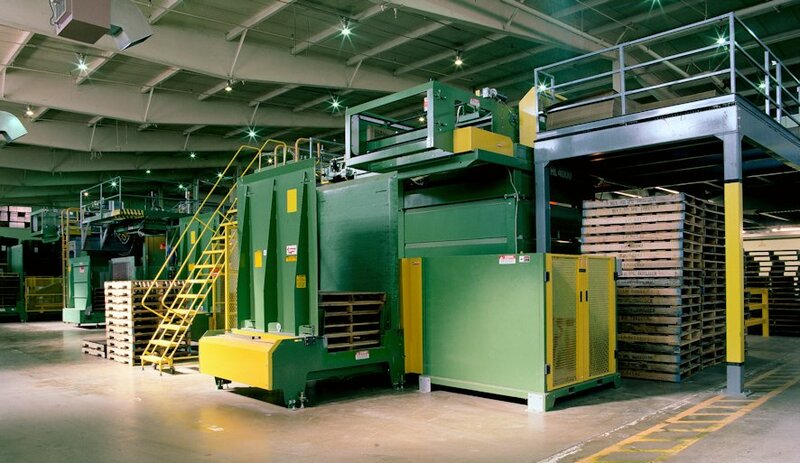 Reliability is a critical factor at International Paper's beverage packaging operation in Turlock, California. Every day, the facility must accurately ship thousands of cartons to customers across the western states as well as to overseas destinations. These cartons contain the packaging products used for milk, juices, and other liquid necessities of daily life. Downtime can be disastrous to an operation like this. Multiple order changeovers need to be made almost literally on the fly. When a carton run is completed for one customer, another order is immediately introduced into the system. The process of getting the right carton to the right palletizer for shipment preparation has to be fast, accurate, and efficient. But, with the old materials handling system in place prior to November 1998, that was not always the case. One of the palletizers, an old-style gantry type, had trouble keeping pace with order demand. The existing merge line sometimes experienced backup problems. And there were multiple "jam" points that required stopping the line, manually correcting the problem, and then ramping up again. Sortation was directed by a legacy reflective tape system that was not capable of managing increasing volumes. "We were just not achieving the kinds of reliability levels needed to meet our shipping goals," sums up Ron Young, Maintenance Team Leader at the 150,000 square-foot facility. The solution was to modernize and upgrade the entire order-flow process. 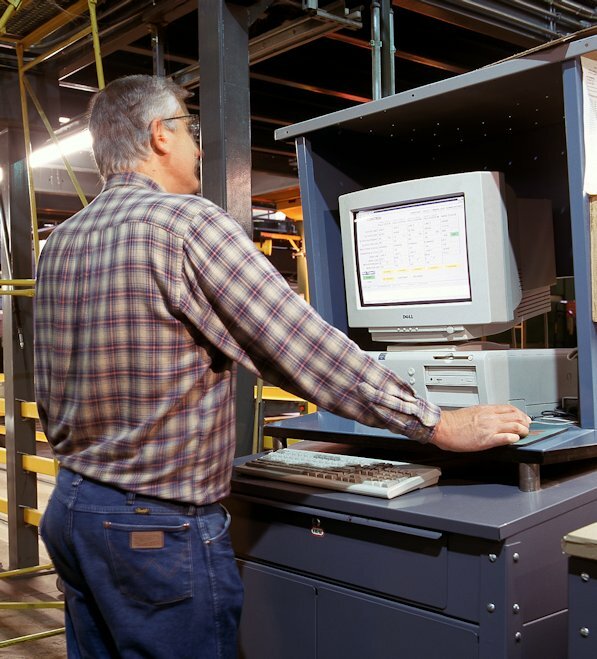 Working closely with FloStor engineers, International Paper created a highly dependable order-flow process that incorporates advanced computer controls, dependable conveyor units, and automatic palletizers. 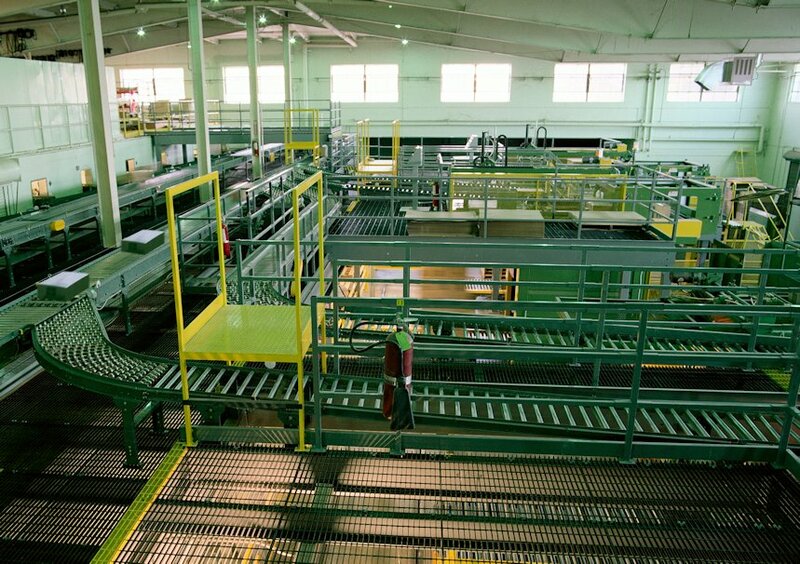 FloStor provided a turnkey service, integrating the computer software, hardware, electrical, palletizers, and conveyors. Product now moves through the Turlock facility smoothly and efficiently. International Paper prepares the product in batches of four customers per wave. The order-flow process starts in the carton-sealing department, located in a walled-off area adjacent to the distribution center. Here the cartons are sealed and imprinted with a human readable and bar code mark that identifies the customer and the destination palletizer. Batch changeovers are entered into the system through the Human Machine Interface (HM I) without interrupting product flow. Seven sealer lines lead from the carton-sealing area to the distribution center. The cartons are moved to the mezzanine level and inducted into a recirculating sortation conveyor in the DC. The recirculation loop allows continuous product flow during batch changeovers. 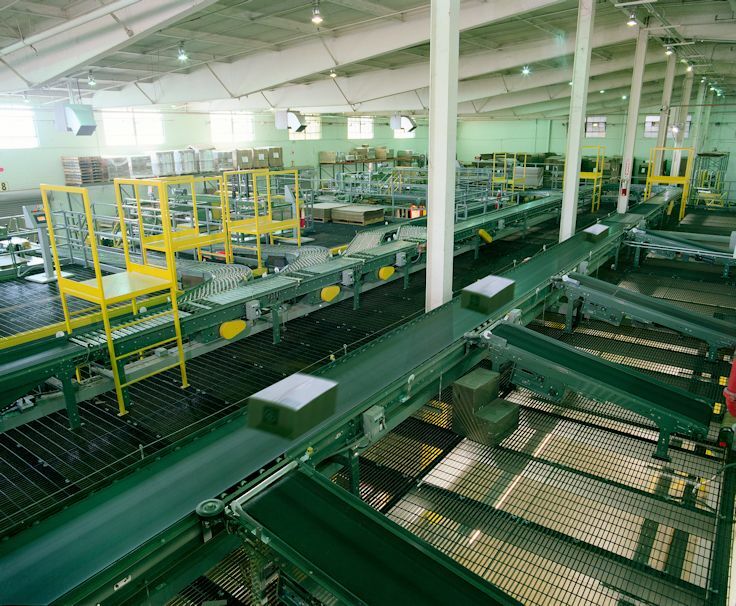 Directed by the conveyor control system, product is sorted to the four lanes leading to the palletizers and the one lane reserved for no-reads, hand stacking of pallets, and other special operations. 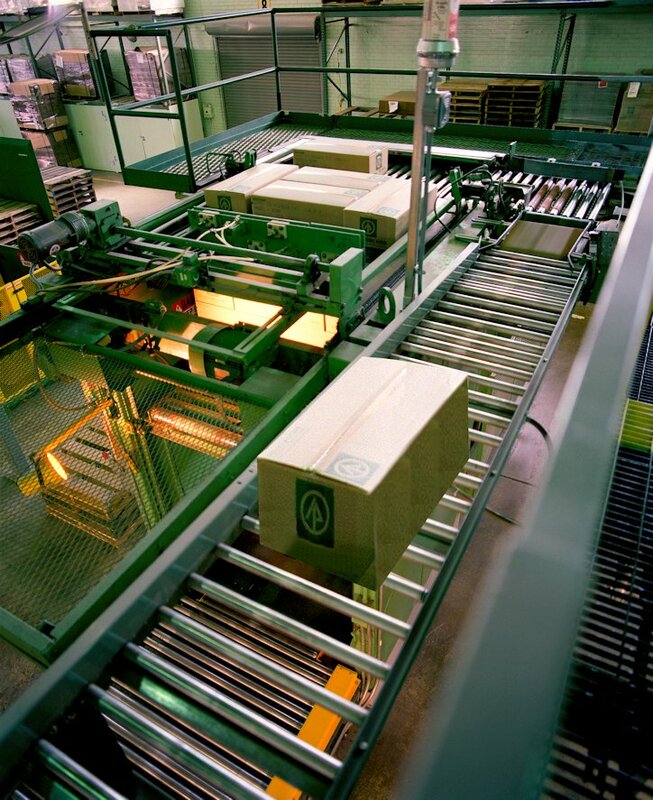 When the pallets are built, the palletizer releases them to an automated transfer car. The car delivers the pallet to a stretch wrap machine. A bypass switch at the infeed of the stretch wrapper allows operators to stop the pallet and install corner parts (when required), label the loads, and perform QC functions. The chain-drive conveyor then moves the pallet from the stretch wrapper onto a gravity conveyor where they await transport by forklift to the shipping area. Management at Turlock reports that the new system has lived up to expectations. "With our order changeovers happening so fast," says Maintenance Team Leader Young, "we needed a system that would give us a consistently high level of shipment accuracy. We now have that." "After a lengthy selection process, our Engineering Group selected FloStor based on their design concept and their ability to do the job. FloStor exceeded our expectations." But the benefits have not stopped there. Less system downtime has lowered the cost per carton shipped. Also, there's less maintenance required on the new conveyor and palletizer equipment, another contributing factor to lower operating costs. 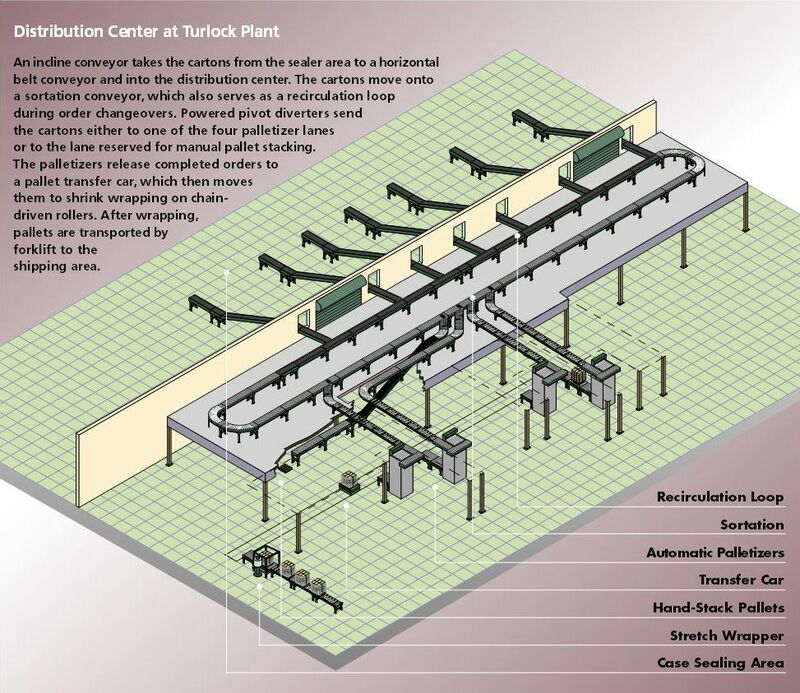 In short, the new system at International Paper's Turlock operation is not only reliable, but also cost-efficient.